← Something Quick for Summer: Figs and Peaches and Tomatoes, Oh My! You know you love an activity/hobby/sport/what not, when you start trying to get other people to come do it with you. I love running, and for a couple of years have been trying to get people at work to run with me. This year our company was unable to secure a spot into the annual corporate challenge. It’s New York City, spots go super fast. To make up for the lack of the corporate challenge, someone approached me about starting an unofficial running club to race together and was wondering if I knew of any post work races that took place in Manhattan. I did. I had seen in one of the few email blasts I actually read something about a Riverside Park 5K Summer Series run by NYCruns.com. They hold very well organized races. Always curious, I figured this fit the bill. Using all the shameless marketing skills I have acquired through my marketing of the Westchester Breakfast Club, I was able to get the word out. The first race we participated in was on July 24. Registration starts at 6, race starts at 7PM. There were three people from work signed up (including myself). It was fun. I beat the other two boys and ran my second fastest 5K ever. I’m a morning runner, so afternoon races are a bit rough for me. I was still surprised with how I did. It had been about 3 years since I ever raced just a straight up 5K, and to come in 3 seconds faster than last time just proves that getting older is just a state of mind. The course is very nice. It’s an out and back course that takes place on the path of the park. It’s hilly, but not Westchester hilly. It’s a narrow path, but there aren’t a lot of racers, so you spread out quickly, and there aren’t a lot of pedestrians on the paths, so it’s not like you have to keep dodging people the whole time. The race takes place around the 108th street entrance to the park. Parking is very easy to find at 6PM (we always arrived around 6, so I can’t speak for the parking situation after). The race is super low key with just a single water table at the start/finish. They pour out a bunch of cups of water before the start so you have something to sip on while you wait. They also put out a really nice spread of random fruits during the finish. Grapes post run are the best. There are bathrooms under the Hudson Beach Cafe which are pretty clean for NYC park standards. I was even able to change in it once with no big issues. A low key race that just costs just $10 (online and race day…no service fee!) means you get no t-shirt. But you do get a bib with a chip for electronic timing. Fancy. The second time we ran it, one person in our trio changed. This time I lost, but clocked in about 20 seconds faster than the last time. The third time, it was me and another co-worker who hadn’t done it before. Actually it was more of a family affair as his brother joined in on the fun, while some members of the family came out to cheer us on! The course, being an out and back within the park makes it very spectator friendly too! All in all, I would call it a success. I ran with 4 different co-workers, and we all had a blast. Maybe next summer we’ll get more people to join us! Maybe we’ll get some t-shirts made! But for sure, we will be back! 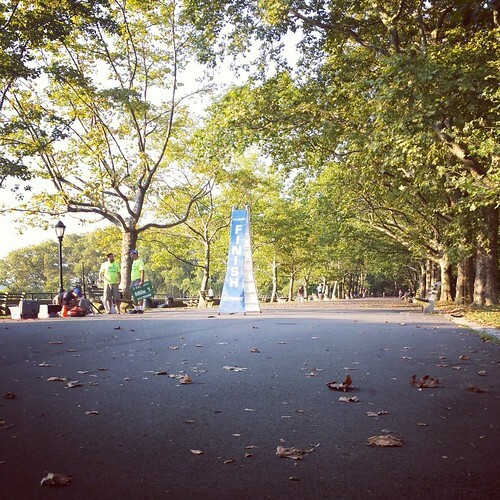 This entry was posted in Running, Uncategorized and tagged nycruns.com, Race report, Riverside Summer Series 5K. Bookmark the permalink.